July 19, 2007, marks the 159th anniversary of the Seneca Falls women's rights convention, a nearly spontaneous gathering of women in a small New York town. The women at this convention—among them famous activists Elizabeth Cady Stanton and Lucrita Mott—approved a "Declaration of Sentiments," modeled after Thomas Jefferson's Declaration of Independence. This "Declaration of Sentiments" called not only for women's equality, but also for women's suffrage, a revolutionary shift for the women's movement in America. Documenting the American South celebrates these pioneering women and other 19th-century feminists whose tireless efforts laid the foundation that helped women finally win the right to vote with the 19th Amendment (1920). Joining the women at the Seneca Falls convention were several notable men, including Frederick Douglass. Douglass so staunchly supported the feminists that when they hesitated over whether to include the sentiment calling for voting, he persuaded them to press forward with the demand. Booker T. Washington's 1906 biography of Douglass includes a description of Douglass's role at Seneca Falls specifically and in the women's right movement in general and reprints an excerpt of Douglass' writings on the subject. Douglass wrote in his magazine, the North Star : "All that distinguishes man as an intelligent and accountable being is equally true of woman; and if that government only is just which governs only by the free consent of the governed, there can be no reason in the world for denying to woman the exercise of the elective franchise, or a hand in making and administering the laws of the land" (p.136). Washington explains that "Mr. Douglass consistently held to these views ever afterward . . . He was always a guest in any large gathering of woman suffragists" (p.137). After the Civil War, a group of women in Louisiana attended another important convention—the 1879 Louisiana State Constitutional Convention—to speak out for women's rights, an issue they felt had been forgotten in the war's aftermath and the debate over African American voting rights. Among these women were writers Elizabeth Lyle Saxon and Caroline E. Merrick. Merrick's narrative, Old Times in Dixie Land: A Southern Matron's Memories, describes her fellow suffragettes' commitment to fighting for expanded legal, financial, and voting rights for women. Merrick and Saxon wrote a petition that argued, among other points, that women deserved the right to vote because they paid taxes, even when unmarried. Evoking the arguments of America's founding fathers, they claimed "that to women as well as man 'taxation without representation is tyranny' she being 'a person, a citizen, a freeholder, a taxpayer,' the same as man, only the government has never held out the same fostering, protecting hand to all alike, nor ever will, until women are directly represented" (p.126). Saxon and Merrick collected four hundred signatures for their petition. Merrick recounts the exceptionally warm welcome Saxon received upon her introduction and writes of her friend, "[She] is a woman possessed of fine intellect and an uncommonly warm and generous nature. 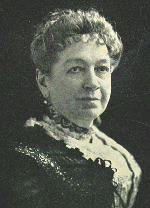 She was a pioneer in the Suffrage Cause in the South, and has ably represented its interests in National gatherings . . . All along the way she has given of her best with whole-hearted zeal to further the cause of women, and should claim the undying gratitude of those for whom she has helped to build the bridges of human equality" (p.128). Saxon's address was published in the June 11, 1879, issue of the New Orleans Times. She later spoke before the U.S. Senate's Judiciary Committee and accompanied Susan B. Anthony on a New England tour. Both Merrick's and Saxon's narratives are part of the "First-Person Narratives of the American South" collection, which includes diaries, autobiographies, memoirs, travel accounts, and ex-slave narratives written by Southerners. The majority of materials in this collection are written by those Southerners whose voices were less prominent in their time, including African Americans, women, enlisted men, laborers, and Native Americans. Washington's biography of Douglass comes from the "North American Slave Narratives" collection. This collection includes all the existing autobiographical narratives of fugitive and former slaves published as broadsides, pamphlets, or books in English up to 1920, as well as many of the biographies of fugitive and former slaves and some significant fictionalized slave narratives published in English before 1920.